Take our surveys to have your say about how NHS services in your area should change. With growing pressure on the NHS – an ageing population, more people living with long-term conditions, lifestyle choices affecting people’s health – changes are needed to make sure everybody gets the support they need. The Government is investing an extra £20bn a year in the NHS. The NHS has produced a Long Term Plan, setting out all the things it wants health services to do better for people across the country. This includes: making it easier for people to access support closer to home and via technology, doing more to help people stay well, and providing better support for people with long-term health conditions. But whilst the national plan has set some clear goals, it’s up to local areas to decide how they’re achieved. Now it’s time for people to have their say and help shape what the delivery of the plan should look like in their communities. 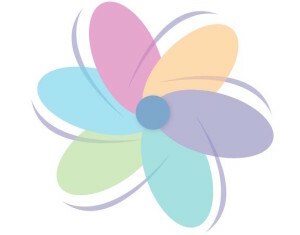 Independent health charity The Kings Fund has produced a helpful guide to understanding the Long Term Plan which can be downloaded here. This entry was posted in Uncategorized on March 22, 2019 by Healthwatch Dudley. 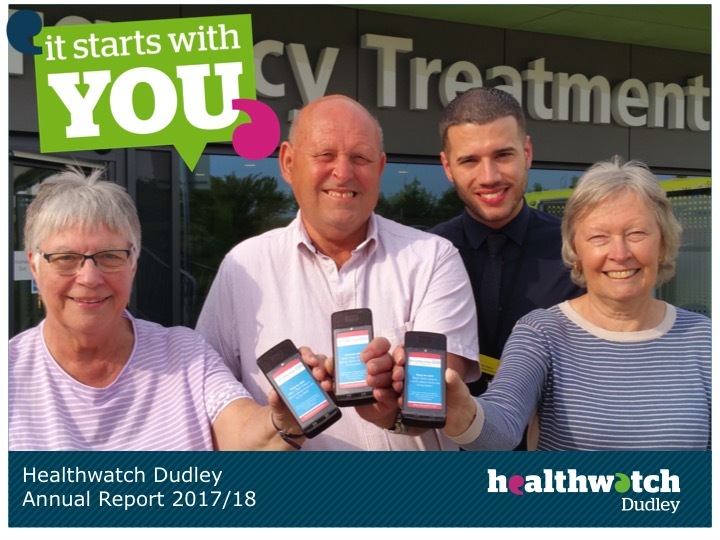 Healthwatch Dudley is working with Dudley CCG and Dudley Public Health to find out what local people think and feel about the important topic of self care. At the beginning of our journey we asked for your help with creating a pack that could kick start lots more conversations – and here it is! Now it’s over to you again. We would like you to use the pack to chat with people who you know about mental wellbeing, minor ailments, caring, long term conditions or the roles that professionals play in our health and wellbeing. 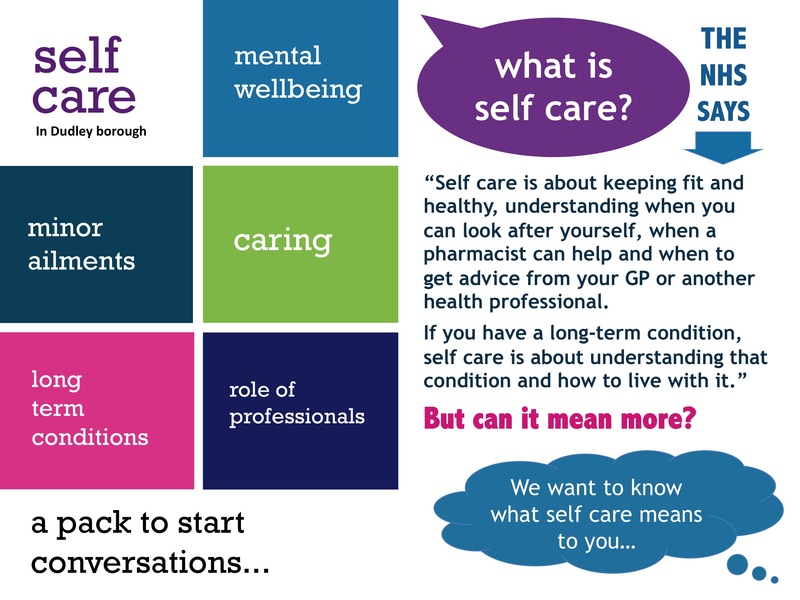 You can choose one, more or all of these themes, all we ask is that you feed back to us what you talked about so that your thoughts and ideas can help to shape a new self care strategy for Dudley borough. Download your pack here or get in touch and we can get a printed copy sent out to you. Then put the kettle on and let’s get talking about self care! This entry was posted in Uncategorized on October 12, 2018 by Healthwatch Dudley. This entry was posted in Uncategorized on June 29, 2018 by Healthwatch Dudley. This entry was posted in Uncategorized on May 24, 2018 by Healthwatch Dudley. This entry was posted in Uncategorized on June 30, 2017 by Healthwatch Dudley. 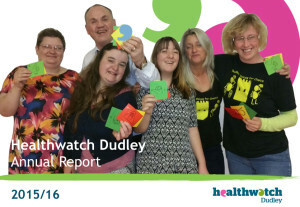 Healthwatch Dudley is award winning! 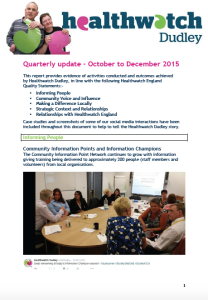 Healthwatch Dudley is independent and local! We are here to give local people and communities a strong and influential voice in health and care. Our 2015/16 annual report shares some of the highlights of how we are reaching out to thousands of people, to listen to their views and experiences and how our strong evidence based reports are influencing local decision making. Download our annual report here. After a busy year, it has been exciting to start our new financial year on a high with being named for two national awards! The Healthwatch England Network Awards took place last month and out of more than 120 entries Healthwatch Dudley was shortlisted in two categories. We were delighted to be presented with a Diversity and Inclusion award for our partnership with Dudley Youth Service to inspire young people to become Dudley Youth Health Researchers. We were also received a Highly Commended Health and Social Care Improvement award for involving communities in our activate approach that was developed with Dudley CVS for the All Together Better Partnership. 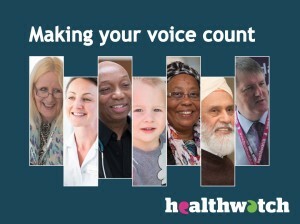 Find out more about our nominations and about other inspiring stories from across the wider Healthwatch Network. This entry was posted in Uncategorized on July 1, 2016 by Healthwatch Dudley. 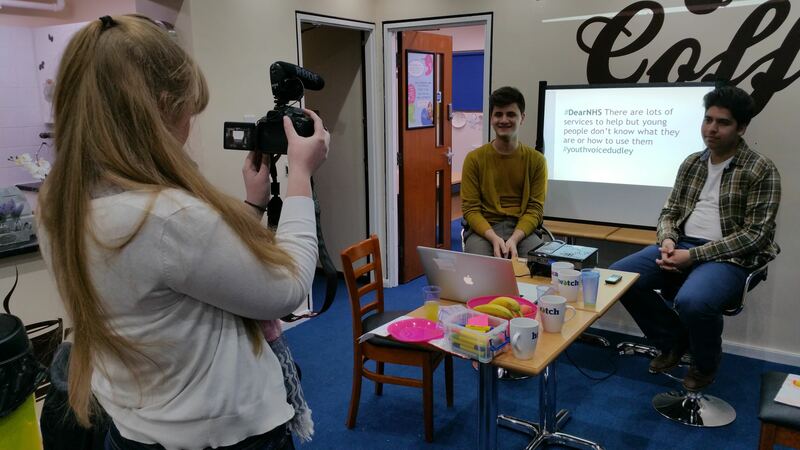 What makes young people choose to get involved with health and care research? Last spring we teamed up with Dudley Council’s Youth Service to begin a journey to find out. 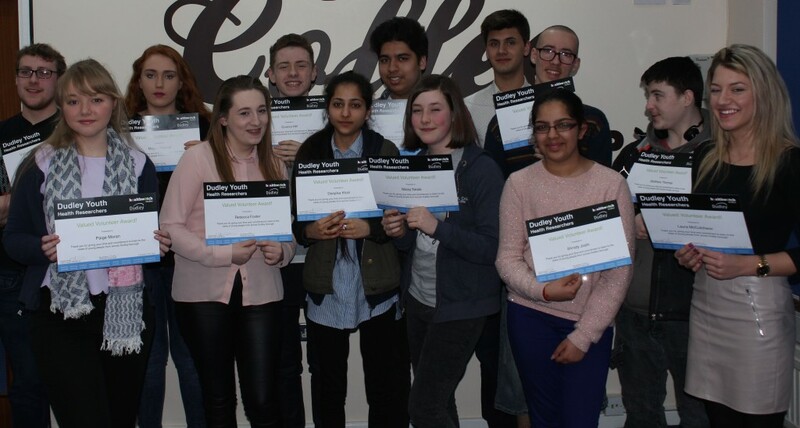 Our two organisations applied for a Youth Voice grant from NHS England and we were successful in our bid to represent the Midlands and East region. Over the last year, the Dudley Youth Health Researchers project has brought together 27 young people with a wide range of health and wellbeing experiences. The group has explored issues that matter most to them and has researched the views of over 1100 other young people about their own health and wellbeing. Dudley Youth Health Researchers fist came together last year after we contacted other organisations who support local young people, to ask if they could put group members forward. Individuals were approached and were invited to a residential to help everyone to get to know each other, boost confidence and get thinking about the issues that they would most like to concentrate on as a team. 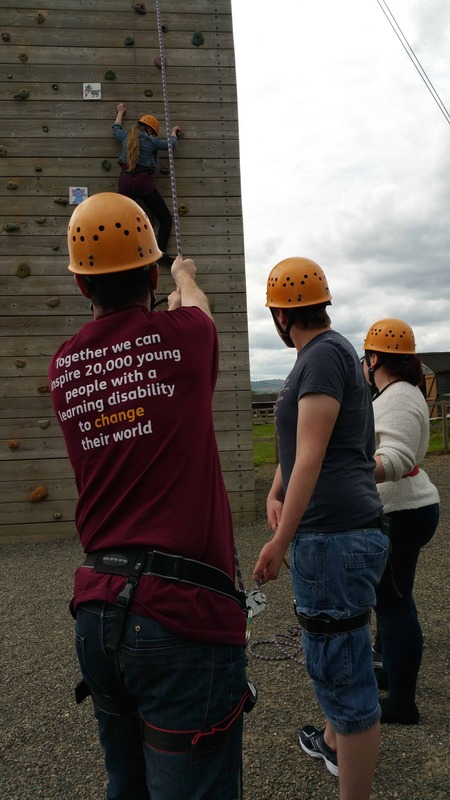 Young people involved had a wide range of different experiences including disability, living in care or supported accommodation, being a young carer, being home educated having knowledge of life limiting illness or simply being a young person living in Dudley borough. Most importantly, they all had a common interest of wanting to make a difference but when asked what defined them as a group, Dudley Youth Health Researchers were adamant that they are all unique individuals and should not be put into boxes. 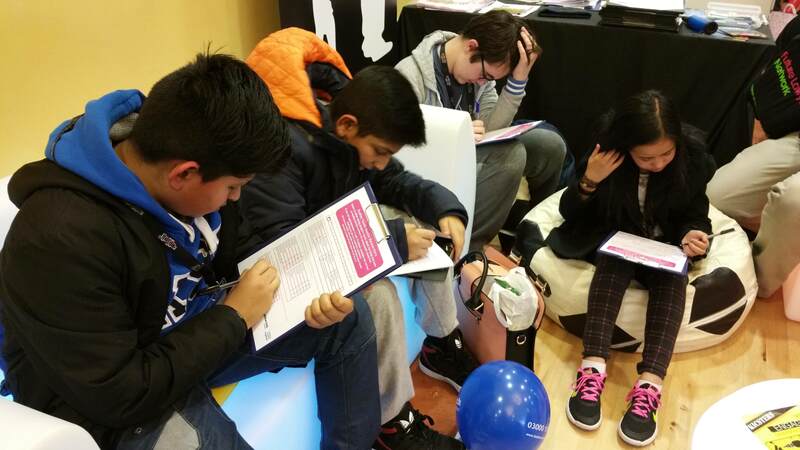 Dudley Youth Health Researchers went on to survey the views of 1100 other young people around these issues and their findings will be compiled in a report on their new website. This phase of the Dudley Youth Health Researchers programme has now come to a close and it has been an important journey for everyone involved. 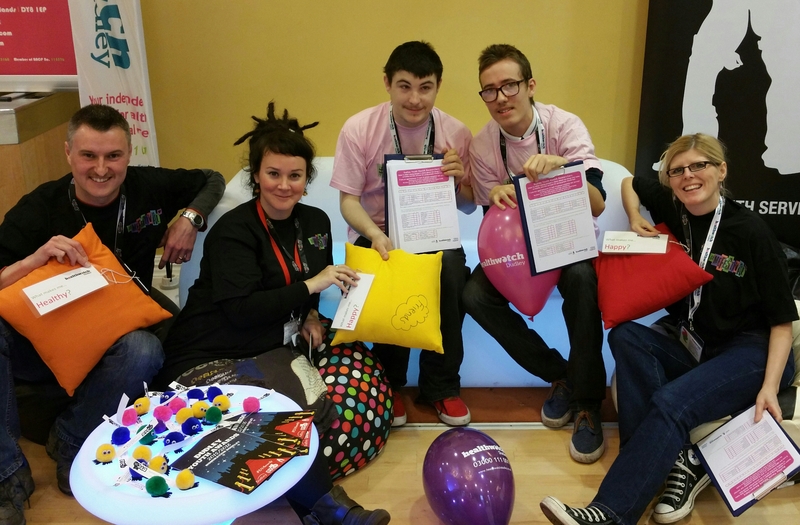 Group members have had some fantastic opportunities, from attending the Manchester NHS Expo, leading regional focus groups with British Youth Forum, leading workshops at the Dudley CCG led Me Festival and presenting at the annual Partners in Paediatrics conference. The latter resulted in an invitation for one of the members to sit on a panel to select a new Chair. 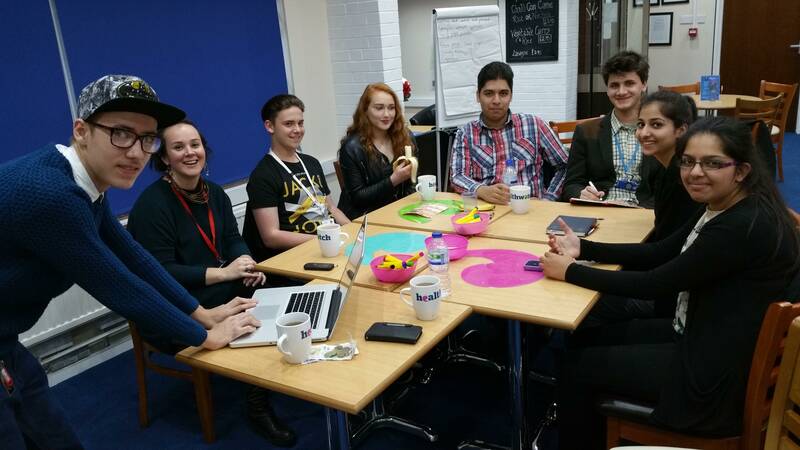 Learning from the project was also presented at the NHS Youth Forum conference at Great Ormond Street Hospital last month. This entry was posted in Uncategorized on March 30, 2016 by Healthwatch Dudley. How are we involving young people in decision making? Who have we been listening to about health and care? Why are we interested in eye health? How many Information Champions have we trained? What is our proudest achievement? 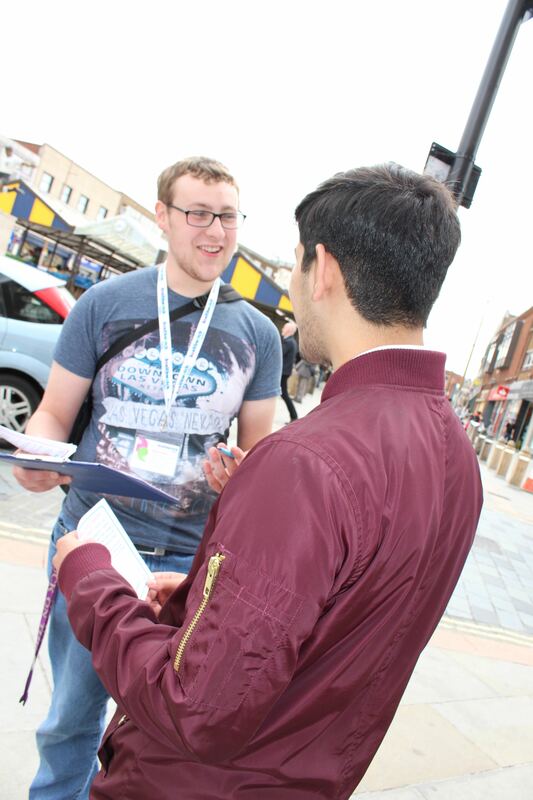 Every three months we are asked to report to Dudley Council and to decision making boards about our work. We think it is equally important for local people to understand what we do and how we help to give you a louder voice about important decisions that affect your health and wellbeing. 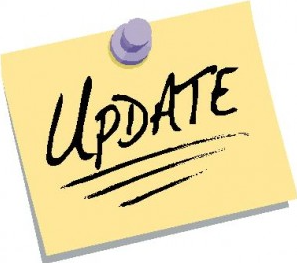 We would like to share our latest quarterly update with you which you can download from our reports page together with a selection of our evidence based research reports. We hope that you will enjoy finding out about our proudest achievements! This entry was posted in Uncategorized on February 24, 2016 by Healthwatch Dudley. Healthwatch Dudley is part of a new local health partnership called All Together Better who want to listen to and learn from local people, about the things that keep communities healthy and well. Every day local community groups and clubs, social enterprises and voluntary organisations are contributing to people being well, healthy and cared for. Health and social care services in Dudley borough are changing and we have been asked by the All Together Better partnership to arrange a series of interactive listening events. People who attend will be able to try out activities to unlock some of the hidden knowledge in communities. They will then be able to take away packs to use with people who they know, support or volunteer with. 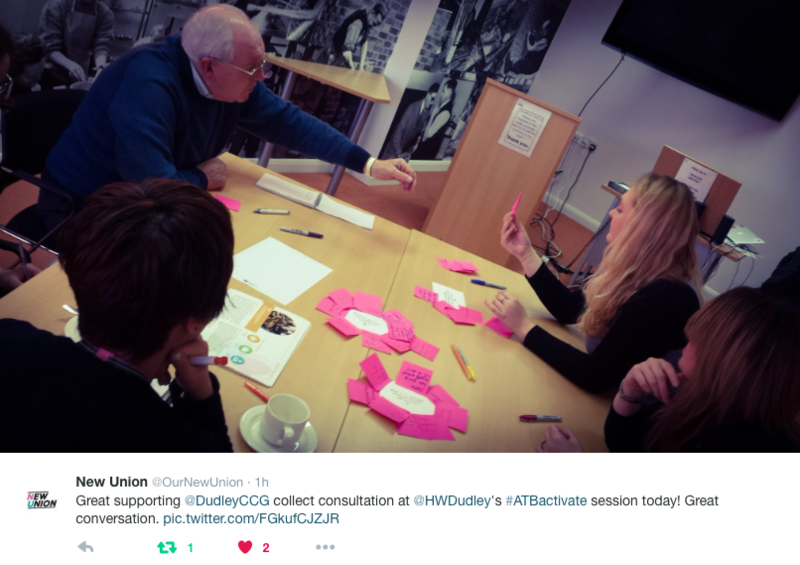 Activity Packs are designed for you to involve people in Dudley’s ‘biggest ever conversation about health and social care’. 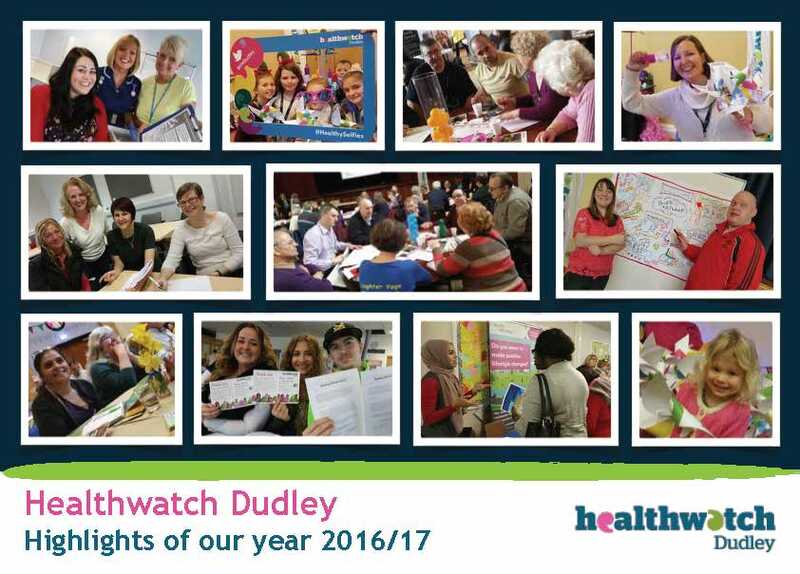 They include ways of giving feedback on your ideas, discussions and concerns to Healthwatch Dudley. Everything we hear will be fed back to decision makers in April. Be in the Know sessions are happening all around Dudley borough including at a People’s Network event! If you can’t make it to an event but would still like to be involved you can still ask for an Activity Pack to work through with people who you know. Contact us to find out more. All Together Better is a partnership which brings together health and social care organisations to review and shape future health and social care services in Dudley borough. Their aim is to ensure that people receive the best possible care with services that continue to meet future challenges and embrace the opportunities for improvement. 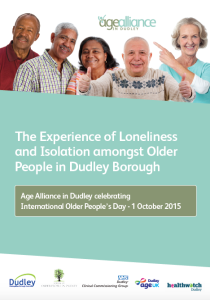 Find out more about All Together Better: www.dudleyccg.nhs.uk/alltogetherbetter @ATBDudley on Twitter. This entry was posted in Uncategorized on January 29, 2016 by Healthwatch Dudley.